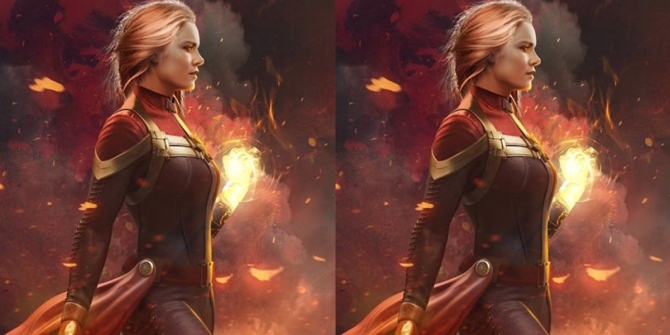 Though we’ve yet to receive any official photos of Brie Larson in costume as the supercharged Carol Danvers, our longing for Captain Marvel (and the ’90s!) has been irrefutably fulfilled thanks to the deluge of leaked set photos that have emerged online all this week. And so, to cap off a busy couple of days for the 2019 spinoff – for the record, directors Anna Boden and Ryan Fleck have been capturing their “galactic war” as of March 26th – Infinity War duo Joe and Anthony Russo have now taken to Twitter to publicly endorse a fiery piece of Captain Marvel concept art. It’s a relatively small piece – both in terms of file size and resolution – so we’ve mirrored the image in order to prevent any pixelation. And though the Russo Brothers were clearly enamored by the artwork of Brie Larson’s soon-to-be Avenger, the filmmakers stopped short of mentioning who’s responsible for this particular piece. Whatever the case, it’s a beauty. Also starring Ben Mendelsohn (Rogue One, Ready Player One), Gemma Chan, Rune Temte, Mckenna Grace and Lashana Lynch as Monica Rambeau, Captain Marvel is due to hit theaters on March 8th, 2019. Closer to home, Marvel Studios has the back-to-back release of Infinity War and Peyton Reed’s Ant-Man and the Wasp, which ought to sate our collective appetite for MCU content right up until that magical moment when Brie Larson’s heroine takes flight.